In 8 balls Dinesh Karthik’s career has changed ~ now perhaps he has more fans than ever before ! ~ Test Cricket is no slambang – no T20 this, yet .. today a pink ball proved to be not so pink as England was skittled out for a paltry 58 inside 21 overs. 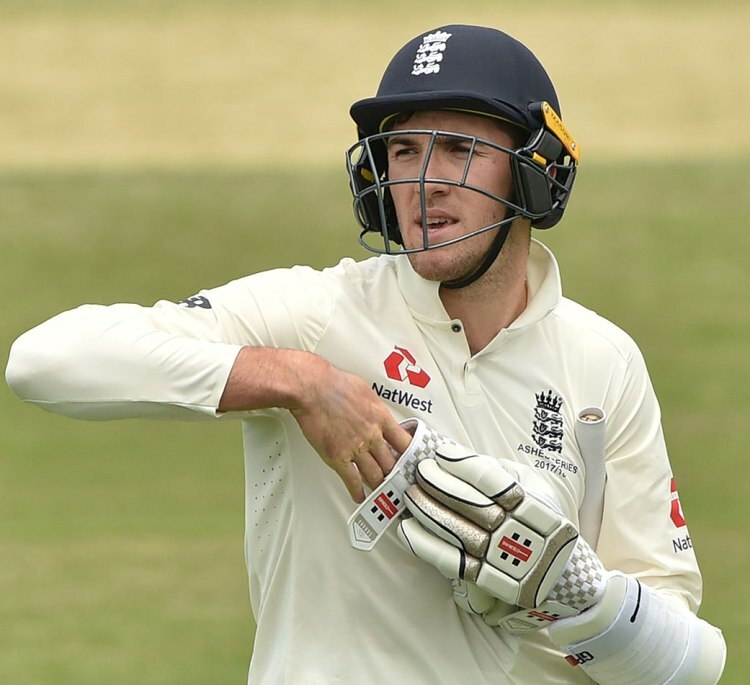 ~ ignominy was shining on the face when England were 27/9 ~ but Craig Overton, one of two Somerset fast-bowling twins, playing his 3rd Test scored an unbeaten 33 - and that made the England coach Trevor Bayliss berate England batting. I have read about smaller totals, this one was embarrassing ! If put into bat on a cloudless afternoon, and tormented by some exemplary bowling by the left-arm paceman Trent Boult, who finished with six for 32 & his partner Tim Southee taking four wickets in a variety of ways, was not enough, NZ scored runs briskly. There was some movement for Boult, in particular, but it was as if the batsmen were playing blind man’s buff after someone had mischievously plastered glue on the soles of their boots. Most of the humiliating records were averted thanks to a cameo from Overton, who seemed to be able to pick up the pink ball rather better than his colleagues. There was one superb flat-batted six off Boult as well as a few, crisp drives in his unbeaten 33 but Anderson could not keep him company for long. Despite that last-wicket partnership, England could not reach their previous lowest score against the Kiwis, which was 64 at Wellington in 1978 when Geoffrey Boycott was the captain. Trent Boult, who could barely keep the smile off his face in the post-day press conference, claimed career-best figures of 6 for 32 while Tim Southee bagged four - they were the only two bowlers needed to clean up a feeble England. Then Kane Williamson, their best Test batsman, ensured they capitalised with a delectable, unbeaten 91 that stretched New Zealand's lead to 117. Away, South Africa fast bowler Kagiso Rabada has been cleared to play in this week’s third Test against Australia by the International Cricket Council. The 22-year-old’s two-match ban has been overturned after his charge of “making inappropriate and deliberate physical contact” with the Australia captain, Steve Smith, during the second Test in Port Elizabeth was downgraded following an appeal. The South African barrister Dali Mpofu successfully argued at Monday’s six-hour hearing that the paceman did not deliberately make contact with Smith’s shoulder during a fiery send-off. Rabada has instead been found guilty of “conduct that is contrary to the spirit of the game” and has been fined 25% of his match fee and received one demerit point – reduced from his initial punishment of three. That leaves Rabada on a total of seven demerit points, one short of triggering an automatic two-match suspension, and he is available for the third and penultimate Test, which starts in Cape Town on Thursday. The series is currently level at 1-1. In Test Cricket – the lowest total is New Zealand’s 26 in Mar 1955 made at Auckland against England in Test 402; India’s hour of shame is ‘42’ –at Lords in June 1974 when they were bowled out in 17 overs. At Eden Park in 1955, Len Hutton's team finished their triumphant tour by setting up a world record – dismissing New Zealand in the second innings for 26, the lowest total in the history of Test cricket. In that 2nd innings only B Sutcliffe the opener made 11; there were 5 zeroes. Tyson took 2; Statham took 3 – Appleyard took 4 for 7 in 6 overs. Long before Dhoni, Ajit Wadekar had taken India to newer heights with Series win over West Indies and England (on tours) – but sadly that tour of 1974 was a disaster…. It is reported that India reached there in a bitterly cold England in April as the leading side in the world. In the previous three years they had won series in the Caribbean and England, and then defeated England at home. Their superb quartet of spinners (Bishan Bedi, Chandrasekhar, Prasanna and Venkat) backed by some top batsmen (Sunil Gavaskar, Ajit Wadekar, Gundappa Viswanath) made them a formidable team, albeit one lacking any real seam prowess. Ten of India's 12 three-day warm-up matches were drawn, largely because of what Wisden described as "outrageously unkind" cold, wet weather, which was a hallmark of the summer. Against Essex and Surrey, the tourists won with Abid ali taking wickets. Indians started soundly with a century partnership between Sunil Gavaskar (46) and Farokh Engineer (86) – the first wicket falling at 131 was no indicator of the things to come; Gundappa Vishwanath made 52; Eknath Solkar, the brilliant fielder made 43 and Indians were all out for 302. Indians following on suffered their worst being all out for ‘42’ (technically for 9 as Chandra was absent hurt) – Only Solkar reached double figures with 18 and remained unbeaten. Arnold had figures of 8-1-19-4; while Chris Old had 8-3-21-5. It all happens in a game !